As you can see from George's photo, he spent some time in the Army Air Corps as an Airman First Class. We have no explanation for this as his discharge does not mention it but George's skills in nighttime parachute jumping did have him training soldiers for jumps over Europe. He also provided training of motorcycle operation over various types of terrain. His motorcycle expertise was from his days fighting fires. Motorcycles were used to scout out the size and path a fire might go and to quickly get men into areas not accessible by a larger vehicle. Info on backside picture: Pvt. 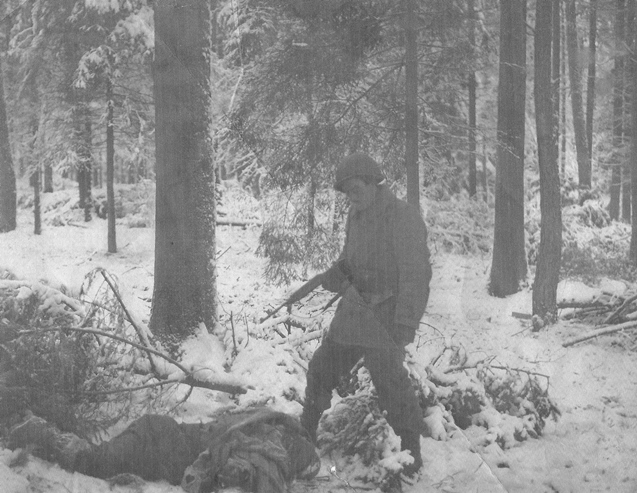 George C. Morrison, RFD #1 Ashland, KY Is shown looking at the frost-covered, frozen body of an American paratrooper in Ardenne Forest, in Belgium. Pvt. Morrison is with a Tank Destroyer Battalion attached to the 82nd Airborne Division, 1st U.S. Army. 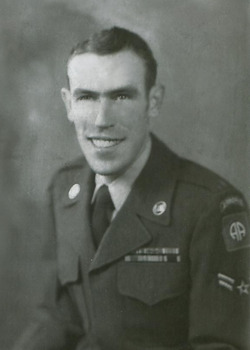 The dead paratrooper also belonged to the 82nd Airborne Division. Belgium 6/1/45. 643rd TD BN, Reharmont, Belgium.